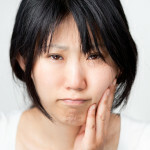 I have recently experienced a bad soreness and pain in my jaw. I went to the dentist and got diagnosed with TMJ. A few weeks later it got worse and now I can only open my mouth half way, and when I try to bite down it hurts. What methods should I take to help cure this? Posted 3 April 2018 under Ask Us. You should call your dentist and let him/her know that the pain in your jaw is worse. Your dentist or health care provider may wish to re-evaluate you to make sure that there isn’t another reason for your discomfort such as an ear infection or tooth related problem. Sometimes your provider may feel it is necessary to have an x-ray or another imaging test. If the reason for your discomfort is due to TMJ, there are things you can do to lessen the pain such as not chewing gum or eating big sandwiches, applying moist heat to your jaw (especially before bedtime), and eating soft foods such as eggs and pasta instead of chewy foods. You may wish to ask your provider about whether it is safe for you to take an over-the-counter anti-inflammatory medicine such as “ibuprofen” for temporary relief of pain. Sometimes, your provider may recommend wearing a mouth guard at night to prevent you from grinding your teeth which often leads to muscle spasms and jaw pain.